Black Friday is the name given to the shopping day after Thanksgiving. It was originally called Black Friday because the volume of shoppers created traffic accidents and sometimes even violence. Police coined the phrase to describe the mayhem surrounding the congestion of pedestrian and auto traffic in downtown shopping areas. The history of Black Friday revealed it was a busy shopping day long before it got its name. In the 1950s, people began calling in sick the day after Thanksgiving to give themselves a four-day weekend. Since stores were open, those playing hooky got a head start on their holiday shopping. Rather than try to determine who was legitimately sick, businesses just added that day as another paid holiday. The name was first recorded in 1966 by Earl Apfelbaum, a dealer in rare stamps. In his ad, he said, "'Black Friday' is the name that the Philadelphia Police Department gave to the Friday following Thanksgiving Day. It is not a term of endearment for them. 'Black Friday' officially opens the Christmas shopping season in center city. It usually brings massive traffic jams and over-crowded sidewalks as the downtown stores are mobbed from opening to closing." Retailers did not appreciate the negative connotation associated with a black day of the week. They had a good point, since the media used it to describe stock market crashes. For example, Black Monday was the name journalists gave to October 19, 1987. On that day, the Dow Jones Industrial Average fell 22%. The Dow's closing history shows that was the largest percentage drop on one day in stock market history. Another dark day, Black Thursday, occurred on October 24, 1929. It was the day that signaled the start of the Great Depression. It was followed the next week by Black Tuesday. On that day, the stock market lost 11% despite attempts by major investors to support stock prices. That destroyed any confidence investors had in the stock market, which in those days was perceived to be the economy. Many had invested their life savings and were entirely wiped out. Retailers wanted to make the name "Black Friday" mean something positive. The Friday after Thanksgiving was one of the most profitable days of the year. Accountants use black to signify profit when recording each day's book entries. They use red to indicate loss. So, Black Friday means profitable Friday to retailing and to the economy. Retail and consumer spending drive almost 70% of U.S. gross domestic product. Retailers adopted the name, but this time to reflect their success. To encourage more people to shop, they offered deep discounts only available on that day. Black Friday crowds still give the police headaches. Since 2010, Black Friday violence has resulted in 10 deaths and 111 injuries.Violence has become so bad the day should be renamed "Black-eye Friday." The states with the most Black Friday violence are Tennessee, Arkansas, Alabama, Louisiana, and Nevada. On the other hand, the safest holiday shopping is in the Midwest, Pacific Northwest, and New England. The worst Black Friday occurred in 2008 when a man was trampled to death at a New York Walmart. Despite being 6'5" and 270 pounds, temporary worker Jdimytai Damour died of asphyxiation when crowds stampeded into the store. At least 2,000 people broke down the doors, trapping Damour in a vestibule where he suffocated. Eleven other shoppers were also injured, including a pregnant woman. These incidents give police the right to call Black Friday by a negative name. In 2017, five people were injured in Black Friday violence. Brawls forced an Alabama shopping mall to close. In 2016, three people were shot in separate mall incidents in New Jersey, Nevada, and Tennessee. The New Jersey man died from his wounds. In 2013, police shot a Chicago Kohl’s shoplifter as he fled in his car. He was dragging an officer who was stuck halfway into the vehicle. The most Black Friday violence seems to occur at Walmart. It was the site of 57.1% of Black Friday incidents within the last decade. The next most violent locations, shopping malls, were the scene of 17.9% of the incidents. Trampling occured at 30% of the incidents while 26.7% of the violence involved shootings. Black Friday violence has become so bad that it's led to the Twitter hashtag #Walmartfights. In 2012, two people were shot outside of a Walmart in Tallahassee, Florida. They were fighting over a parking space. Walmart's consumer electronics department seems to be the most dangerous place. In 2011, a woman pepper-sprayed a crowd at a Walmart in Los Angeles. She was trying to get a Wii for 60% off. 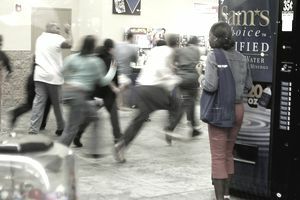 The year before, crowds at a Sacramento Walmart forced the store to evacuate when they started pushing and shoving to get deals on consumer electronics at 5:30 a.m.
On Black Friday 2009, another California Walmart, this time in Rancho Cucamonga, needed police protection from unruly crowds. Again, the incident happened in the store’s consumer electronics department during the early-morning hours. The store was briefly closed a few hours after another store in nearby Upland was closed. Retailers want to make Black Friday a positive event. But shoppers, intent on getting good deals, have turned it into Black-Eye Friday. You must weigh the rewards of saving money with the risk of getting hurt. In recent years, the best Black Friday deals are not on Black Friday. Many retailers offer their best deals earlier. For example, the best electronics bargains are in early November. The best day for Christmas decor is November 22. The best day to buy toys is the day before Thanksgiving. With the popularity of online shopping, Cyber Monday has begun to offer great deals. Many people also wait until Green Monday in mid-December to take advantage of last-minute bargains.